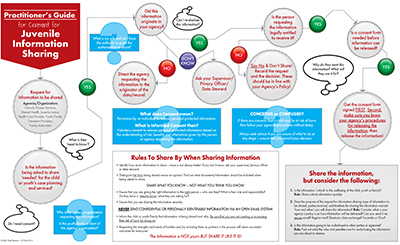 A form fillable consent form that self populates required disclosures when sharing information in a multi-agency collaborative is available for use. Click Here to Download. A non fillable form has been developed and is available for those wishing to use a paper based version. Click Here to Download. An online training guide is in process and will be available soon. If you have questions or would like ACG to work with your collaborative to customize a consent form for your jurisdiction, please contact us at: info@acg-online.net or at (303) 979-8722. The Practitioner's Guide is an info graph created to use as a tool to assist practioner's through the decision making process of consent - when is consent needed, when should it be asked for and who is the agency or organization asking for it. The infograph was developed through NJISI Training and Technical Assistance efforts and from requests for assistance with policy development and privacy procedures from juvenile and youth serving agencies in the fields of at-risk youth and juvenile justice. The Extension Wizard is a tool developed by the NJISI program that alleviates the difficulty of developing proper information exchanges. The tool hides the complexities of this process by guiding users through a series of steps to successfully develop data exchanges. The Extension Wizard tool is an exchange-defining tool that is being made available to the non¬technical community and that will ensure XML Schema conformance with National Information Exchange Model - NIEM. 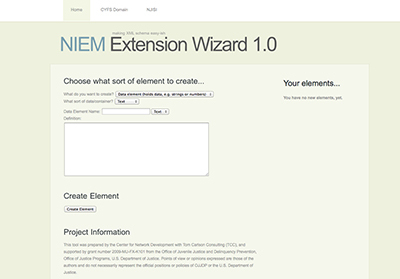 The Extension Wizard provides a simple web page that users can access to build information sharing objects using the JJXDM or, other domains contained within NIEM. Users of the tool can easily define new data, which would hold information such as student identification numbers or strings of text, for example descriptions or notes. Users will also be able to define new information, which would assist in completing their information exchange. By combining new information or data with the existing information contained in the juvenile justice data model; the user can easily define a new data exchange component that is conformant with NIEM. Click here to access the online version of the Extension Wizard tool. Click here to download the Extension Wizard to your local computer.